At first I suspected it was a joke. I’d been trying to land an interview with Dylan since 1987, when I was appointed editor of SongTalk, the journal of the National Academy of Songwriters. But it was no joke; the call came from the office of Elliot Mintz, who was then Dylan’s press rep. The arrangements surrounding the interview were cryptic and incremental. Elliot’s assistant called me periodically, each time divulging a little more information. At first I was given no time or location, told only that it would take place in the middle of the week at a hotel somewhere in the middle of Los Angeles. Also that I should come alone. It felt like arranging a meeting with Batman. When you read this, keep in mind that he was smiling. “Songwriting? 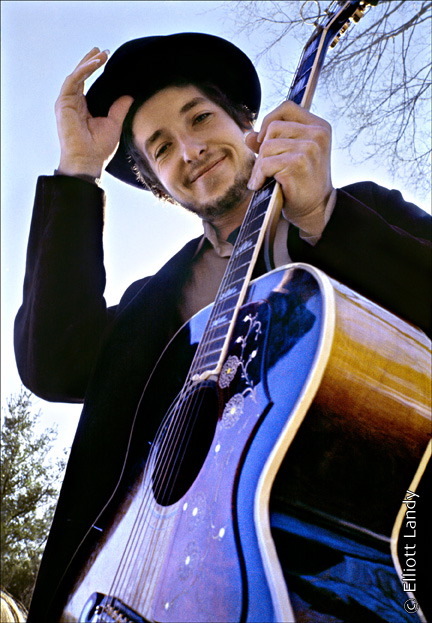 What do I know about songwriting?” Bob Dylan asked, and then broke into laughter. He was wearing blue jeans and a white tank-top T-shirt, and drinking coffee out of a glass. “It tastes better out of a glass,” he said grinning. His blonde acoustic guitar was leaning on a couch near where we sat. Bob Dylan’s guitar. His influence is so vast that everything that surrounds takes on enlarged significance: Bob Dylan’s moccasins. Bob Dylan’s coat.